The book introduced the Captain Marvel hero, whose imprint on the comics world is seen in two movies in early 2019. LEFT: Captain Marvel was introduced in Whiz Comics #2 (#1), and this copy graded CGC 6.0, sold for $173,275 in May 2018. 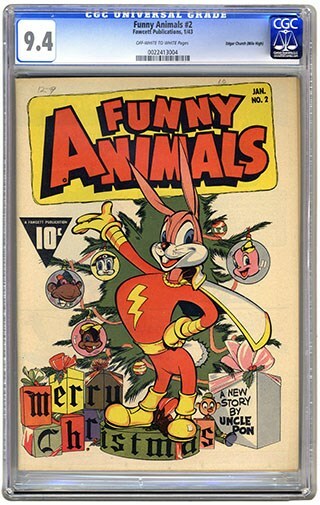 RIGHT: The first comic with Captain Marvel's rabbit doppelganger on the cover was Fawcett's Funny Animals #2, and this copy graded CGC 9.4 sold for $1,092 in January 2006, also through Heritage Auctions. What makes it special? This book saw the introduction of Captain Marvel, who anchored the Fawcett Comics world of the 1940s. Young Billy Batson is given the power to transform into a superhero by saying the word "Shazam!" Unfortunately, his superpowers did not include immunity from lawsuits, and the company that eventually became DC Comics successfully argued the character was too similar to its own Superman. Thus, Captain Marvel was discontinued in 1953. Starting in 1972, DC licensed the original character from Fawcett but was forced to use the name Shazam, since Marvel Comics by that time had developed its own character called Captain Marvel. Marvel's character has gone through a series of incarnations, the latest being Carol Danvers. Why is it interesting now? Two movies are about to be released based on the Captain Marvel characters. In March, the Marvel Cinematic Universe rolls out "Captain Marvel," spotlighting the Danvers character. Meanwhile, the DC Extended Universe is releasing "Shazam!" in April, inspired by the original Billy Batson version. Did you know? Besides Whiz Comics #2 (#1), other key books in the parallel sagas of Captain Marvel include DC's revival of the character (Shazam! #1, February 1973), as well as the beginning of Marvel's version (Marvel Super-Heroes #12, December 1967), the first appearance of Carol Danvers (Marvel Super-Heroes #13, March 1968), the first appearance of Danvers as Ms. Marvel (Ms. Marvel #1, January 1977) and the first appearance of Danvers as Captain Marvel (Avenging Spider-Man #9, July 2012). Adding to this offbeat history, there was also once a Golden Age rabbit version of Captain Marvel called Hoppy the Marvel Bunny (starting in Fawcett's Funny Animals #1, December 1942), who can activate his own superpowers by saying "Shazam!" 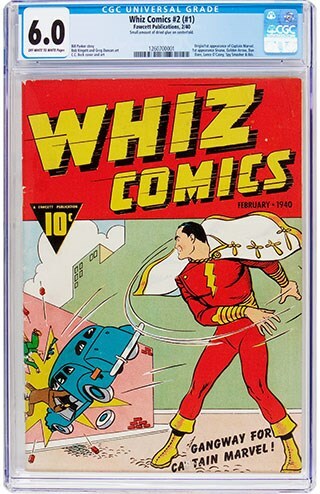 Total graded by CGC: CGC has graded 50 copies of Whiz Comics #2 (#1), so designated on the CGC Label since it was actually the first edition in the title (despite saying No. 2 on the inside cover). There are 23 in the Universal grade, and 27 more with the Restored label. CGC median grade: The median grade for these books is Very Good/Fine 5.0. However, the ones with Universal labels have a median grade of only Good+ 2.5. Sales highlights: A Whiz Comics #2 (#1) graded CGC 6.0 sold for $173,275 in May 2018 through Heritage Auctions. A copy graded CGC 5.0 Restored sold for $26,290 in the same sale. CGC Comics Registry Champion: A set named The Big Red Cheese, by NewForceComics, is the current non-obscured leader in the Whiz Comics set type, thanks in part to a Whiz Comics #2 (#1) graded CGC 3.0. Explore this and other collections in the CGC Comics Registry.